Fayzabad District (Persian: فیض‌آباد‎) is one of 30 districts that comprise Badakhshan Province, Afghanistan. In 2005, several portions of the district were sub-divided to create several new districts within the province. The remaining portion is home to approximately 46,000 residents. 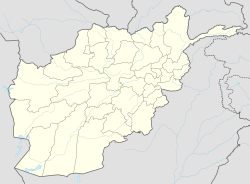 This Badakhshan Province, Afghanistan location article is a stub. You can help Wikipedia by expanding it. This page was last edited on 23 April 2019, at 02:15 (UTC).